We are off on our trip to south Africa. Signing up for this 15 months ago, it seemed like an impossibly long distance in the future. Somehow, time rushed by and here we are. Of course the insanity of modern travel continues. We are flying Delta because that was where I could get a flight on miles. This morning, we checked in, cleared security (thank you TSA pre-check! ), and headed toward the gate. I wanted to find the Delta lounge at SFO. Imagine my surprise to find that it was outside the secure area. What an insane design that is. The photo of shows our feet cramped against the bulkhead. 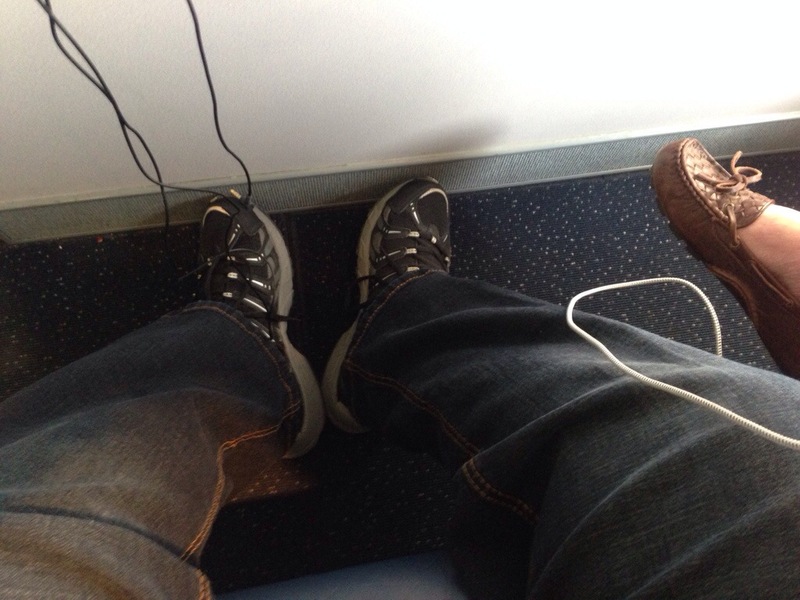 On Delta, even in first class there is no legroom. Yeah – I’m so ancient, I can recall when flying was fun and elegant! I think you have to be a bazillionaire to enjoy that these days! Hi C&G, I didn’t know you were going to South Africa. I went there for three weeks in 1996, and it was probably the most memorable vacation I’ve ever taken, certainly among my top ones. I felt South Africa was perhaps the most beautiful place I’ve ever been. Much of the Capetown environs seemed like a combo of the best of LA and SF. Enjoy, bud! Who ever told you to get bulk head seats? thanks for doing the air. Ill work on AMS for you. Can’t wait for all your posts!